A collective of theater and media artists committed to the creation and production of aesthetically innovative and emotionally compelling works that address sociopolitical realities in a direct yet artful way, embracing complexity and contradiction. In this courageous, unsettling, experimental piece set in a mythical casino, Butane Group uses the metaphor of addictive gambling to tell the story of the 1953 CIA-led coup that brought down the democratically elected secular Iranian government of Prime Minister Mohammad Mossadegh, setting in motion a course of events resulting in the current religion-based government of Iran threatening U.S. interests today. Constructed by director Noel Salzman with Tamara Schmidt and the participation of Meghan Frank, Rodney Hakim, Armistead Johnson, and Mireya Lucio from sources as diverse as reality TV shows about addiction and CIA and U.S. government documents and memoirs, seven actors blend realistic and abstract performance styles to show how the unseating of Mossadegh -- who had nationalized Iran's oil industry, undermining U.S. and British interests -- was ultimately disastrous, as the Shah's subsequent tyrannical rule lead to the 1979 Islamic Revolution and its aftermath. In a compelling tour-de-force performance as Kermit "Kim" Roosevelt, Jr., the CIA operative who masterminded Mossadegh's fall and the Shah's reinstatement, longtime Richard Foreman stalwart Jay Smith moves from casual confidence to anxious desperation. With his pudgy, malleable face; understated, often comically offhand delivery; and fluid movements, his Roosevelt is a disturbing comment on ruthless power and greed divorced from conscience and morality. Dorothy Abrahams, who has the handsome features, inner fire, and fierce idealism of the young Katharine Hepburn, is marvelous as the principled Mossadegh. Nicholas Warren-Gray is appropriately reserved and thoughtful as the young, impressionable Shah, and Rodney Hakim gives a moving, intelligent performance as tortured dissident writer-poet Reza Baraheni. Albert Aeed, Gavin Starr Kendall, and Kelly Markus also do able work in supporting roles. While the 80-minute intermissionless piece gets off to a slow start, the pace picks up considerably in the white hot second half, when Salzman's cleverly choreographed staging of Roosevelt's emotional and political meltdown drives home the work's potent, timely observations on U.S. foreign policy in the Middle East. 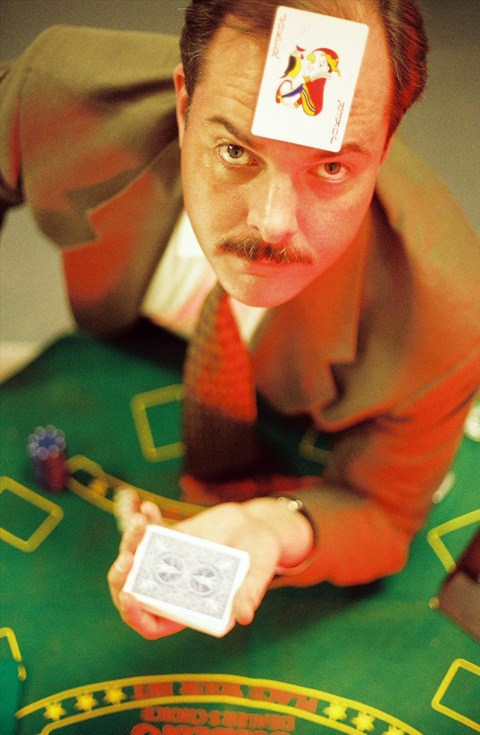 Standing behind a casino card table, a tear-gas pencil tucked in the inside pocket of his blazer, CIA officer Kermit Roosevelt played by the insouciantly mesmerizing Jay Smith, a veteran of several Richard Foreman intravaganzas may seem like a figure out of Ian Fleming. But Roosevelt's byzantine intrigues in 1950s Iran, as laid out in the Butane Group's informative Operation Ajax, are the stuff of espionage history, not fiction. In 1953, Roosevelt engineered the coup that pulled the Persian rug out from under democratically elected prime minister Mohammad Mossadegh (a dignified Dorothy Abrahams) who had nationalized Iran's oil industry and replaced him with the brutal Shah Mohammad Reza Pahlavi. 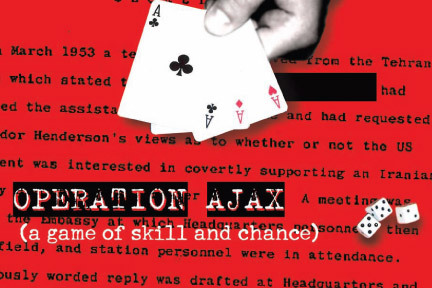 In Operation Ajax, Roosevelt is rendered into metaphor as a reckless gambling addict: at first blase, later eddying into sweaty, overdrawn desperation. The script for this theater of CIA operations, written by director Noah Salzman with an assist from Tamara Schmidt, is a documentary collage drawn from sources both obvious (Roosevelt's memoir Countercoup) and less so (the reality-TV show Intervention). Conjured from a manifestly humble budget, Salzman's stagecraft effectively communicates the arrogance of American intervention abroad; like the Butane Group's last offering, 2004's The Loneliness of Noam Chomsky, this dramatized op-ed ends with a litany of American military and intelligence projects around the world. One doesn't hear much about such things on the evening news: Alternately amusing and chilling, the play serves as an appropriately barbed newswire. Constructed from no less than 25 text sources (memoirs, documentaries, plays, poetry, novels, films, reality tv shows), the piece tells the story of the CIA's 1953 coup against Iran's first democratically-elected government. Placed in a casino context, the densely-layered performance explores how the addiction to risk and gambling has become a potent metaphor for U.S. foreign policy. The CIA's first covert coup against a foreign democracy. • BBC News, "Timeline: Iran"